WiFi Baby, in partnership with SunshineApps, announces the release of the WiFi Baby HD App, an iOS-based baby monitor App that provides password-protected video and audio without interference. 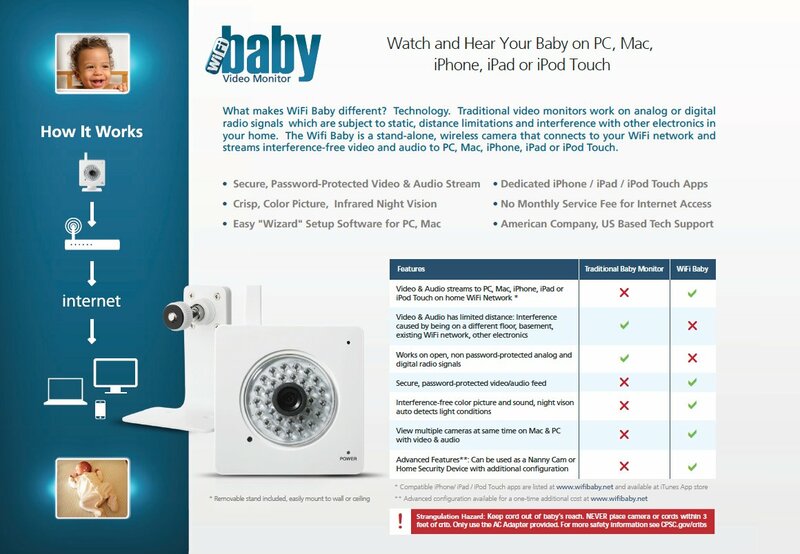 The WiFi Baby HD App securely connects to the WiFi Baby 3G Video Monitor, a stand-alone camera that streams video and audio on a home WiFi or 3G network to PC, Mac, iPhone, iPad or iPod Touch. WiFi Baby, in partnership with SunshineApps, announces the release of the WiFi Baby HD App, an iOS-based baby monitor App that provides password-protected video and audio without interference. By using the WiFi Baby HD App, parents now have the comfort and convenience of seeing and hearing their child on their iPhone, iPad or iPod Touch. The WiFi Baby HD App securely connects to the WiFi Baby 3G Video Monitor, an innovative stand-alone wireless camera featured on CBS News, CNET and Fast Company. Unlike a webcam, the WiFi Baby 3G requires no physical connection to a computer. WiFi Baby CEO Stefanie Fox developed the WiFi Baby Monitoring System with the busy lives, privacy concerns and budgets of parents in mind. "We have taken great care in providing quick start guides, setup software and instructional videos to make the setup for home monitoring as easy as possilbe,” said Fox. 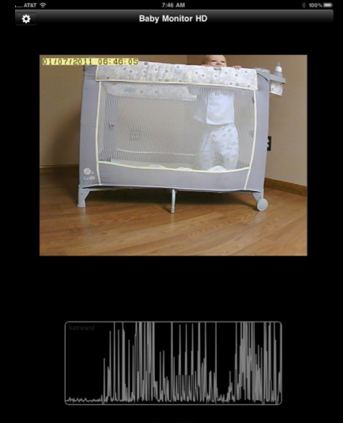 The privacy risks of traditional baby monitors that use non-password protected analog or digital radio signals have gained nationwide attention including a recent feature on ABC News. Besides the WiFi Baby System’s intended purpose as a home baby monitor, it also has advanced features. The user's wireless router can be configured to allow password-protected video and audio outside of the home by PC, Mac, iPhone or iPad. It can then be used as a nanny cam or home security device once users outgrow the need for a baby monitor. This process can vary from easy to complex based on the internet service provider’s restrictions, security settings, brand of router and how the home network is configured. Links to online screen shot guides to setup external viewing are at wifibaby.net or advanced tech support is also available for a one-time cost. There are no subsequent monthly fees for remote access. Florida based WiFi Baby is a company that leverages advanced technology to bring a new wave of wireless baby monitors to market. 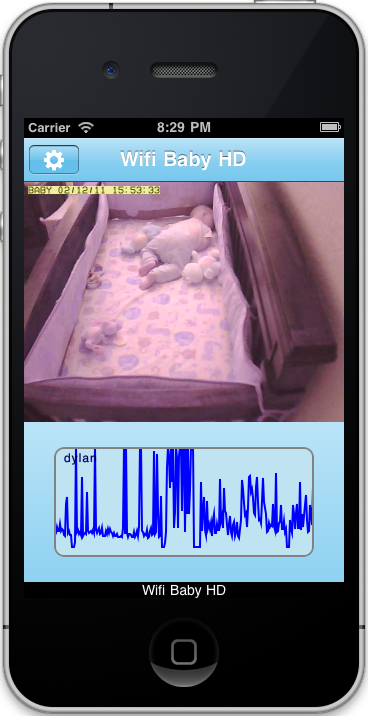 WiFi Baby has partnered with SunshineApps to provide a complete video baby monitoring solution that uses WiFi technology, but in the same price range as those using analog or digital radio signals. 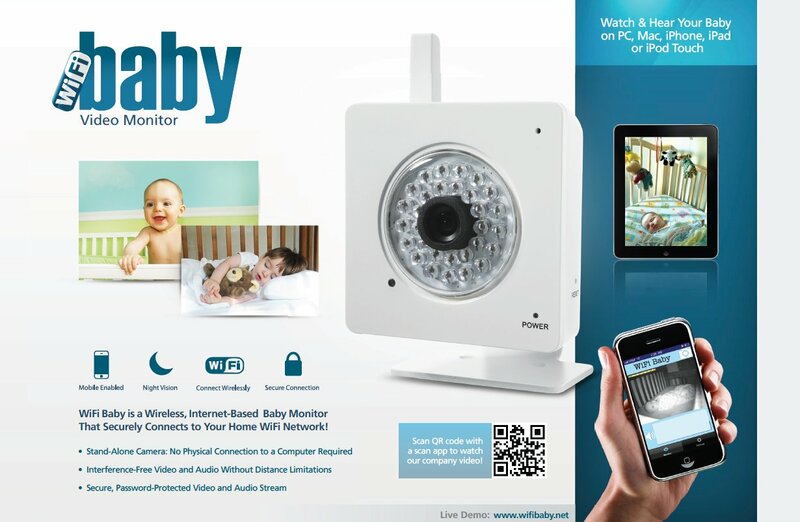 For more information on the products WiFi Baby offers, a company video or a live demo, visit wifibaby.net. SunshineApps specializes in iOS Apps for Smarter Connected Homes & Businesses. Founded in 2009, and with a growing portfolio of Apps with sales in 53 countries, they are highly skilled in producing quality Apps for iPhone, iPad and iPad Touch including WiFi Baby HD and Baby Monitor HD.